Step back in time as you enter Cottage 75. 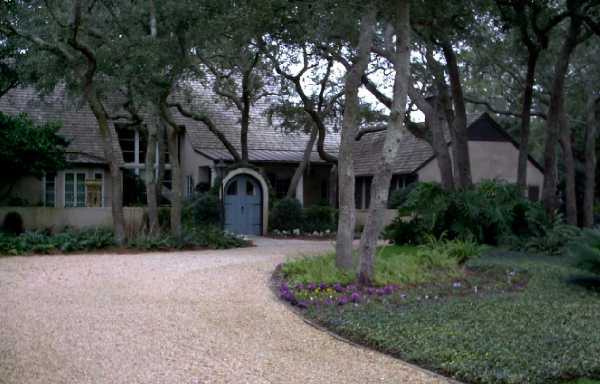 This home truly is a Sea Island original! It was designed in the 1920’s by Francis Abreau, Palm Beach architect who is noted for his design contribution to The Cloister. The nostalgia and charm of this time period has been preserved yet updated to meet the needs of a large extended family. 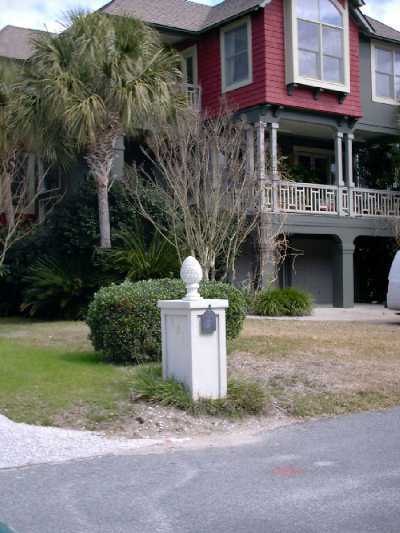 This 7 bedroom and 6 ½ bath home is perched on the sand dunes and boasts a view from every room! The first thing you will notice as you enter the home is the immense living room. The homeowners worked closely with local talents, Guyton Design Group and Pease Construction to help create a comfortable retreat for a very large family. The rooms include an eclectic mix of fine antiques and gorgeous new furnishings. The windows were left bare to bring in the sunlight and allow you to take in the wonderful view. Step out on to the sun porch. You can hear the ocean waves, smell the salt air and almost hear the children playing on a summer day! The dining room has wonderful cypress paneling which had been hidden under layers of paint. The nine foot long table was custom made from old pine and is perfect for breakfast mornings overlooking the sea to large, more formal gatherings in the evening. The kitchen was updated with new appliances, lighting and plumbing however the stainless steel counter tops were cleaned, polished and kept to maintain the integrity of days gone by. This house is truly a smart design. There are four bedrooms in one wing of the home. Each room has a view of the ocean or pool. Two rooms are considered master suites each with a king sized bed. The children’s wing is on the opposite side of the home. What was once the servant’s quarters has now been updated to become a playroom and three children’s rooms. Each bedroom is outfitted with a twin bed and trundle, allowing up to six children to sleep comfortably. What was once a screened porch has been enclosed and is now complete with a durable tile floor and glass walls. The porch serves as the family’s main entry; a perfect place for wet beach towels and flip flops. This beach house is grand and timeless and reflects the essence of family life that is so important to Sea Island living! 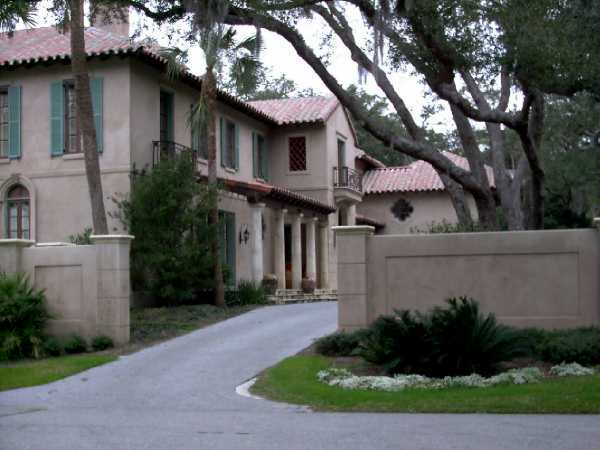 This classic Sea Island Mediterranean –style residence is certain to be a show stopper. Well known local architect, John Shackelford, and interior designer, Nancy Stoddard have created an exquisite, yet family-friendly vacation home for this extended clan. The owner boasts an even dozen grandchildren-all whom visit often! Set beneath a canopy of great oaks, the dramatic stucco-finished exterior features iron banister and balconies and covered breezeways. The home overlooking the picturesque marsh is a creative mix of antique furnishings, beautiful fabrics with special attention to detail. You will want to notice the fine collection of art throughout the home. From the foyer, limestone columns lead into the adjoining dining room, where a unique ceiling of rough-hewn beams and terra cotta pavers awaits. The living room features an antique buffet deaux corps used as a pass through to the bar. Local faux artist, Lisa Moody has created a special effect at every turn in this home; make sure you notice the elevator! The library is a room in which to linger; spectacular mahogany cabinets out of the Jergen mansion in Cincinnati, are noteworthy. This home features three master suites, four guest rooms, a media room, and a children’s play room which connects to the most delightful suite of all…the bunkroom, which sleeps twelve of course! The exit yields yet another bit of wonder-a stunning outdoor shower adorned with beautiful Italian tiles. Is this perfect way to end one’s day at the beach, yes? As you approach this beautiful home it is apparent that you are in for a treat! You will pass through the arched garden gate and will be immediately drawn to the splashing sound of the 18th century limestone fountain. This charming country French home was renovated in 2001 under the direction of architect John Shackelford. So many creative elements were added with the goal of creating a comfortable island retreat for this big-city family. As you enter the foyer you will notice the beautiful limestone floors that are accented with blue and white Portuguese porcelain tiles. The home is brimming with lavish French antiques, predominately Louis XIV and Louis XVI. You will notice at once the handsome 18th century walnut and chestnut table that is carved and features sliding panels, as you enter the living room. An 18th century Abusson tapestry hangs on the adjacent wall. The view of the marsh through the elegantly draped window draws you into the room. The dining room features a handsome limestone dining table, while the room is softened by fabrics in muted tones and a lovely collection of blue and white Chinese porcelain adorns the wall. Each bedroom truly is a masterpiece! Atlanta interior designer, Kristen Johnson helped to create a home that is infused with warmth, color and pattern which delivers a relaxed elegance. Toile fabrics play an important role in these rooms. Rich colors are used in an earthy palette of greens, browns, terra cottas and french blues. As you tour through this beautiful home, take time to notice the carefully chosen accessories. At the top of the stairs there is a Louis xv painted clock. In the son’s bedroom, there is a pair of hand colored engravings of birds by John Gould circa 1865. 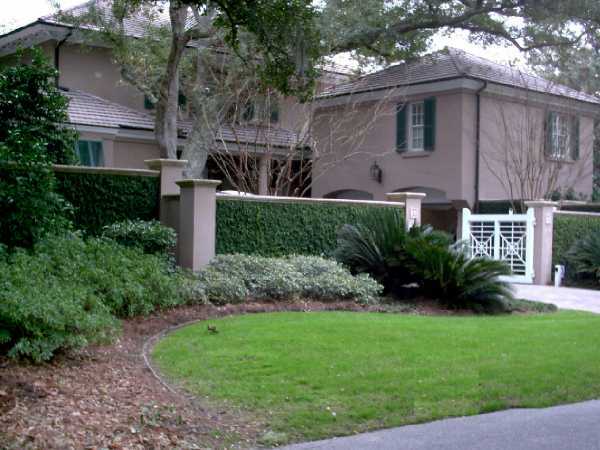 As you exit the home, take a moment to enjoy the marsh side yard and pool. The owners of this magnificent residence have surrounded themselves with beauty and ambience. Savor the provincial flavor…au revoir! Bless the island where I am! Bless the joy that here abides! Bless the blessings without end! Sunshine is the prevailing theme through out this beachside family cottage. Once decorated as a formal home, island casual living reigns now. 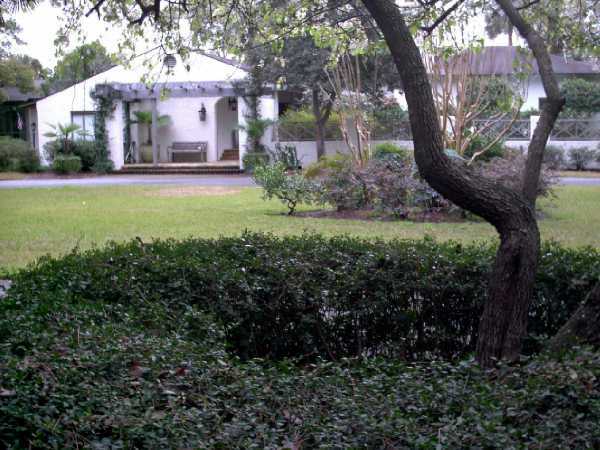 The owners had visited Sea Island many times and often admired the Nunnally estate on Butler Drive. How thrilled they were when they discovered this lot in 1995 which was once the driveway to that estate. With a design by Atlanta architects, Nichols, Carter and Grant, construction began in 1997 with local builder, Bill Cofer. The plans were designed to accommodate two beautiful oak trees on the property. Interior designer Judy Marriot Taylor helped to create a delightful mix of furnishings and accessories that present a nautical theme. As you stroll through the home notice the vintage pond yachts, old coastal sea charts, antique boat engine gears and many varieties of sea shells. This home is brimming with original artwork with most pieces depicting a salty seaside theme. This collection includes many pieces by famous artist Campay. As your are drawn through the French doors to the courtyard beyond, you discover a refreshing swimming pool complete with its own bridge, a fabulous grill and entertaining area and lush gardens. 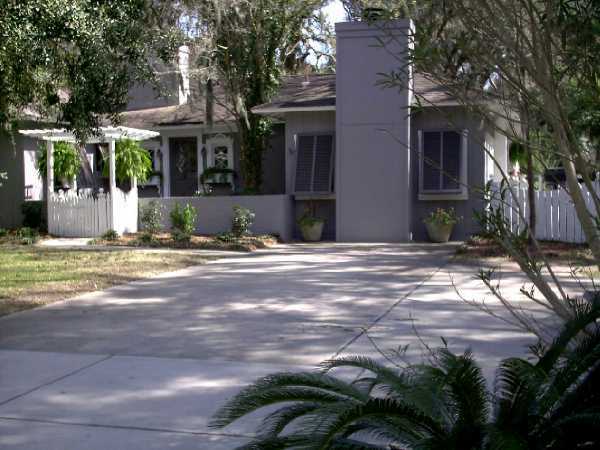 This is a favorite spot of the homeowners, their children and five grandsons! Imagine the laughter and fun on a summer’s day. As the house is overflowing with family and friends…it was thoughtful planning to include a guest house in the design. This retreat is complete with two bedrooms, full kitchen and living area. You will agree that Cottage 508 is a family home where comfort reigns supreme! 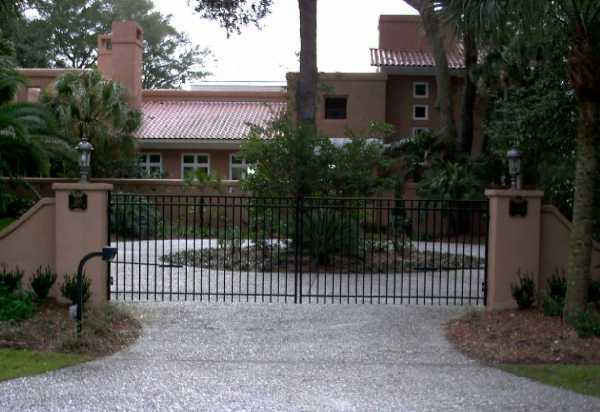 The old is made new again in this luxurious home located in the heart of the Village on St. Simons Island. You just may have seen this home before. It has been featured on Home and Garden Television with Kitty Bartholamew, in a book, Tattered Treasures, and in magazines such as “Romantic Homes”. This home embodies the décor style “shabby chic” and it will inspire you to search through your own family’s tattered treasures! Originally designed by local architect, Ussury-Rule Architects PC, and constructed by local builder Tommy Tolleson, the present owners have made this place their own. Plan for a great deal of time at this stop as you will want to go through it at a snail’s pace. There is so much to see! A neutral palette has been used so that the unique and creative pieces might be seen to their best advantage. These rooms are a collection of still life paintings for your enjoyment. The individual groupings are ever changing and artfully arranged! These pieces have been collected by the homeowner throughout her travels of the southeast, wherever she might like to stop that day! You’ll see sea shells, a collection of wooden baskets, broken china and lovely old hutches in which to display it all. You’ll see vintage paintings, ceramic urns, and wooden pieces hanging on the wall with their many layers of paint all telling a different story. The home has other lovely attributes. Note the incredible views of the St. Simons Island Sound from the balconies with their doors open to let in the gentle breezes. Windows abound and sunlight floods the master bedroom and bath with its enormous tub. Tropical green plants and candles in antique candle sticks give the area a timeless island feel. At the back of the home, there is a lovely swimming pool and patio. There is plenty of time and nothing too serious so relax and enjoy this stop. You will leave feeling that new life can be found in old things when you have vision! The understated elegance of this stately home combines the best of classical features and coastal living. This home was featured on our tour many years ago. At that time we learned that President Jimmy Carter stayed here as a house guest. Under the direction of local Interior Designer, Dawn Bauer, this home has just received a dramatic renovation. Old World meets modern age as this home was expanded and furnished with busy lifestyles in mind. Heritage and tradition are important to this family. You will notice ancestral photographs depicting a strong Spanish Cuban origin. The home features many architectural delights from the handsome coffered ceilings in the family room to the custom designed iron works by local artist Steve Schuttle. With more than 8000 square feet of living space to explore, you’ll want to take time to savor your surroundings. The breathtaking finale to your experience will be the lush manicured gardens complete with swimming pool, tennis court and guest cottage. The European inspired cobbled patios are a new addition. The lovely landscapes are created by island newcomer Charlie Flatt with Belmar Landscape and Gardens. His goal was to soften the formal English garden with local plant life and to visually enhance the curves of the garden with a splash of annual color. 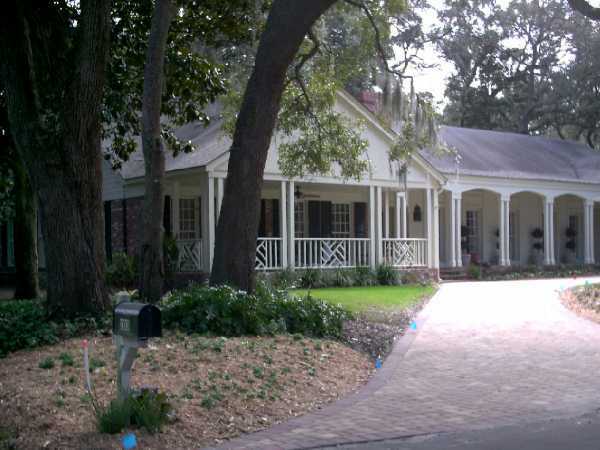 Just steps away from bustling Frederica Road, nestled in the shade trees and azalea bushes is a warm family retreat filled with creative and unique touches. The old and new are expertly blended to create a cottage known as Dogpatch. Open the door to a delightful, light-filled entryway adorned with photographs and family treasures. These are among the many pieces that you will find from the past. Through out this home, fabric rules! The homeowner used her design skills to create unique window treatments, upholstered headboards and skirted sinks. Florals laugh with plaids which whisper to soothing suedes. It lends the cottage a feminine air but no man would be out of place here! Among the many pieces you will find from the past are a beautiful hand carved bed in the guest room that once belonged to the owner’s great grandmother. Note the rosewood piano in the living room dating back to the 1800’s and being prepared to be passed to the fourth generation of women of this family. Family heirloom collections accent every room! The cozy atmosphere that pervades this home was a labor of love. It is most evident in the kitchen and family room. With its original pine paneling, hand painted cabinetry and warm fireplace, it creates the perfect spot to spend an evening with family and friends. You’ll not want to leave this stop without a cup of tea, some home baked cookies and a good chat with a friend! Casa del Rio, influenced by Mediterranean design is a home that has been recently renovated to meet the needs of an active family. The homeowners worked with local architect Ed Cheshire to expand the home and to add more light and allow better views of the river and natural setting. As you enter the foyer, you find yourself greeted with a spectacular view of the river and marsh. The dramatic murals painted by local artist, Virginia Kalp give the feeling that you have entered a secret courtyard. This is accented by columns, beautiful iron gates and antique chandelier. The rooms are awash in a palette of warm Mediterranean colors…terra cottas, spicy golds, deep plums and leafy greens. Many of the walls are finished in interesting faux treatments. Nature abounds inside and out. This is evident through the homeowner’s eclectic selection of original artwork, accessories and fabrics. There is a splendid view from every room in this home. Many rooms overlook the swimming pool and patio, the gazebo in the distance followed by the bend of peaceful Jones Creek. You will not want to miss the newly added Master suite which is complete with library and elegant bath. The men will love the Gentlemen’s retreat at the top of the stairs outfitted with surround sound theatre, handsome card table and full bar. This is a large home with many delights at every turn. Casa del Rio… an island retreat that affords a lifestyle of relaxation and a communion with nature.